We are so honored to have been chosen as the recipients of two grants to help fund our public learning garden and Op Shop programming during the summer. A special thank you to the Kiwanis Club of Hyde Park and to the Hyde Park Garden Fair for their generous support! This has been a wonderful two months: thanks to Peter Cassel form MAC realty for the generous sponsorship of this space and everyone who has made this iteration so full of joy and growth! Thank you all! We look forward to seeing you again soon. Daniel Tucker: Farm Together Now and Grand Closing Party for Op Shop! Come out and enjoy the last evening of this Op Shop with us! Daniel Tucker will be here to talk to us about his newly released book: Farm Together Now: A portrait of people, places and ideas for a new food movement. Books will be available for $20 and Daniel will be present for signing. See the calendar for more details. Light refreshments will be served. “Give and let live” A fabulous benefit bazaar of agriculture (plants, art and food) to purchase and taste- made by this month’s Op Shop participants! Here is a list of what we will have. Sheets will be available for sign up for Op Shop Time Bank! 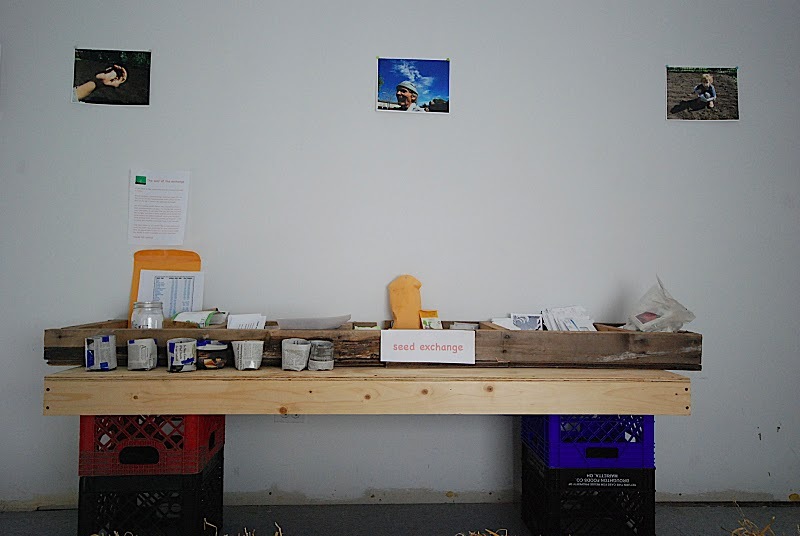 Seed Bank is still Open for exchange! * * Volunteers needed and appreciated to help take down the Op Shop Sunday from 1:00 – 5:00 pm. Time Bank hours will be earned! You can hear some of their music here: http://silenttongueschicago.bandcamp.com/. Come and join us for a social gathering of The Hyde Park Village, Good Neighbors, OWL, and the Op Shop community at large. This will be a chance to meet in person those you may have met online, get to know one another, and find out about our various organizations, goals, missions, struggles, and successes. Come share a POTLUCK meal and a drink together and participate in a live “happening” of our own creation with opportunities for input and collaboration on future programs and activities. The Op Shop and the Hyde Park Historical Society invite the community to bring memories of this area to share for a special oral history program. Bring photos, ephemera, articles of interest, stories pertinent to North West Hyde Park. Keynote speakers will be Sam Guard and Paul Durica. Community members Ruth Knack and Joe Marlin will also shareto their memories about the NW corner of Hyde Park, lovingly referred to as “Side Park” by the locals. Everyone is welcome to take part! Coffee will be served. Please bring snacks and folding chairs to share! * check out Paul’s Kickstarter campaign to fund the full-scale reenactment to honor the 125th anniversary of the Haymarket Affair on the original site, near the corner of Randolph and Desplaines. Come and learn how yogurt is made with The Yogurt Pedaler: Annie Lambla. After the demonstration Annie will tell us all about the farms she has visited and the “dairy-ing” process. 6:00 – 7:30 pm: BEER! Mini beer making workshop with Mark Yeary. Prost! Learn how to brew beer at home using commercially available recipe kits. In this demonstration we will make a one-gallon “mini-beer” batch, proceeding from cleaning and preparation to boiling and the cool-down stage. During the boil, we will discuss necessary and optional equipment for home brewing, handling and farming of yeast cultures, use of secondary fermenters, and the bottling process. We will have a limited amount of homebrew available for tasting during the demonstration. Prost! Come to the last Open Mic of this iteration and bring your instruments, voices, poetry, prose, comic acts, dance, and whatever else you want to share! BYOB- Potluck style snacks and drinks. New Project by Kiku Hibino in collaboration with Yoko Katagiri. Performance piece: “Desk Theories II” by Volvox, Théatron. This is a charity event to collect donations for relief efforts for Japanese nuclear contamination victims. Let’s celebrate the end of Op Shop IV with this last Sunday Potluck Dinner. Reconnect with old friends, meet new ones and share our favorite dishes! Looking forward to seeing you all again! Let’s not be sad, we will reemerge somewhere else, someday very soon! Ongoing Project and gratitude to Lia Rousset and Amber Ginsburg – Connect-the-Lots! * Volunteers needed and appreciated! * Folding Chairs are needed to borrow! View photos of our progress at our new and greatly improved website. Our benefit party was a real success! A special thanks to Gail Isenberg, Keith Peterson, Project Film, and Doug Folgelson, who together made a wonderful evening of art, music, and delicious and unique cocktails! Plus, we were able to pay off our rent for this Op Shop with the proceeds! Thanks so much to everyone! This is a community quilting Project. We will be quilting baby blankets and adult lap blankets for patients undergoing chemotherapy and little ones who are in the neonatal unit at the University of Chicago Hospital. These blankets will be distributed by the “Forefront Stitchers,” a volunteer group at the hospital. A systemic, meta-systemic, and meta-meta-systemic presentation on using the mix tape for meaningful communication. Untitled: An Interactive Performance by Charles Mahaffee. All guests are invited to bring something to read aloud during the course of the performance (this may be anything, a poem, an essay, a lease, a recipe, etc.). 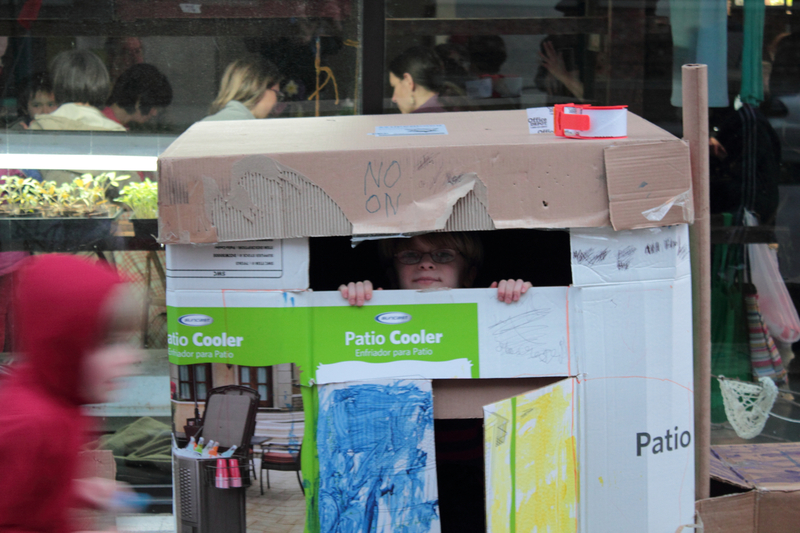 Sunday April 17th 3:00 – 6:00 pm: “Junkyard Playground!” Talk and Fort Cardboard! Come join us to discuss the history and significance of the Adventure playground movement. Bring the kids, we will have duct tape and cardboard for them to create their own ad hoc junk playground. Please bring junk to play with, any art supplies to make signs and snacks to share. We will also have some things on hand. Check out the website before coming to have an idea. http://adventureplaygrounds.hampshire.edu/history.html “Soft Junk Playground” will be the title and working theme of Op Shop 5! Theme: Kids! Let’s create dishes with children in mind – foods they may love, foods you loved as a child, and/or funny foods or arrangements! Ongoing Project and gratitude to Lia Rousset and Amber Ginsburg- Connect-the-Lots! Chef Donna Binbek, proprietor Simply Food Chicago Personal Chef and Catering located here in Hyde Park, welcomes you and your family and friends to come out and celebrate the beginning of spring by making these easy to prepare rolls for your dining pleasure. Please RSVP to info@theopshop.org. Cost of workshop: $10 – please check online calendar for details. Opening of salon style photography exhibit. What’s the buzz around here? Come learn about honey bee basics at this fun, informal workshop. We will discuss beekeeping in the city and show what is entailed in starting your own hive. Cocktails from you Garden with Gail Isenberg! Come to a cocktail party and learn how to preserve the flavors of your Summertime garden and farmers market by making vodka infusions! Gail Isenberg will talk about the process and hand out drinks. A preliminary menu includes Sakitinis (cucumber vodka with a splash of saki), garden Bloody Marys made with vodka infused with heirloom tomatoes, celery, hot peppers, and horseradish, and a cooler made with a grapefruit, lemon verbena, and scented geranium infusion. Samples of what remains from last summer (shiso, ginger peach, and thimbleberry) will be available until they run out. Relax and anticipate spring and summer with a glass in hand. $10 at the door, all proceeds go to benefit the Op Shop! Project Film is a local indie-pop duo that put out a debut record last fall about moving from Minneapolis to Chicago. Guitarist and singer Sam McAllister and singer Megan Frestedt, who also run the independent record label Tandem Shop in Chicago, will be playing an acoustic show tonight. Their music is recommended for fans of Wilco, Death Cab for Cutie, and Mates of State.” Check them out at their website. $5 at door for band only. Conrad Freiburg plays the Ukulele! Come hear artist Conrad Freiburg play his unique and beautiful songs on the Ukulele. Says Conrad, “I use the same innate or internal, self-taught styles popularized by Roscoe Holcomb.” Conrad will also be selling his CDs and Harmonographs! Don’t miss his show It Is What it Isn’t at the HPAC! 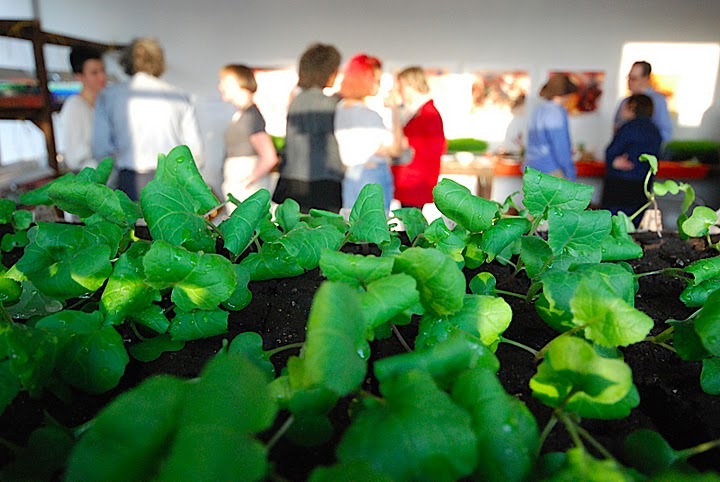 Meet and talk with Ken Dunn about his work in Urban Agriculture, stories, and history. Theme: Asian Cuisine: In keeping with the photos of Julia Pagnamenta and the food demo with Donna Binbek, we will focus on varied, fresh, and delicious cuisines of your favorite Asian culture. * Donations are welcomed and deeply appreciated! Janice Bees is moving north to Minnesota! To celebrate this move and to honor the work she has done at Op Shop, we are hosting a little send off party for Janice! Party is potluck style BYOB! 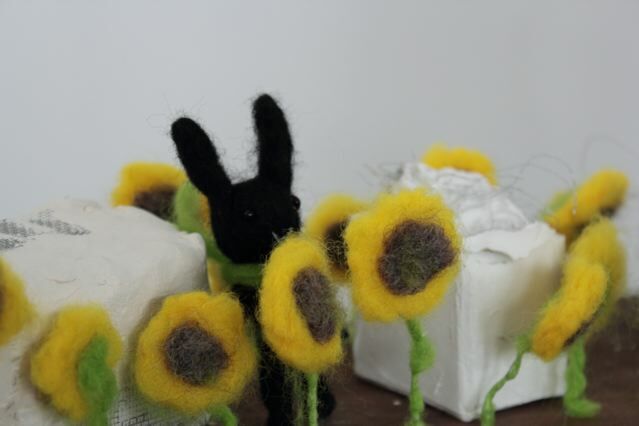 The students from the course, The Meaning of Work, will present their art journals and construct an art quilt from wool and silk materials naturally dyed in class. This course, a joint class between the City Colleges of Chicago and DePaul University School for New Learning, examines the tensions between work and leisure activities, between craft and technology in modern times, between mass production and handmade articles, and between man-made techniques and natural materials. Come and bring an instrument, your voice, your poetry, your stories, and more to share! The first Open Mic was wonderful. Bring a snack or something to drink to share- audio potluck! Sunday, April 3rd 6:00 – 9:00 pm: Uber Tuber and Potluck Dinner! Potato postcards, Uber Tuber T-shirts, Tuber Talk and much more by artist Eric Bartholomew, potato lover extraordinaire! In honor of his presence at the Op Shop we dedicate this potluck to all root vegetables with a Spotlight on the Potato! * There will be a cook-off for the best potato salad, remember to bring a plate, utensils, glass and napkin, in the spirit of sustainability! * BYOB and collaborative cleanup! Clothes SwOP and alteration workshop with Janice Bees! Janice Bees will bring her sewing machine, scissors, needle, thread, ribbons, buttons, zippers, and various doo-dads, and will be on hand to help you re-construct and de-construct your newly acquired duds! Come bring your old fabrics, some torn jeans, a cool but stained skirt, cut them up, patch them, rearrange them and attach them. This is going to be a fun evening of reconstruction and deconstruction and clothes swap. Bring your old, too tight or too loose and swap them for your “new” and your perfect fit. BYOB! Please feel free to bring snacks and drinks! This workshop is free but donations – as always – are welcomed! 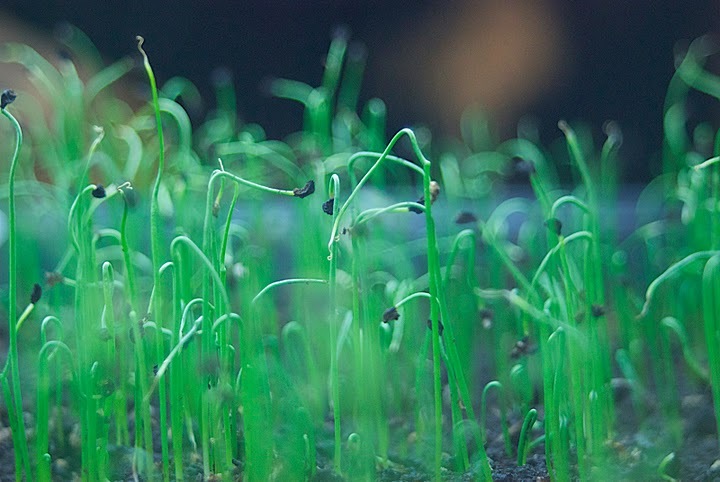 Gabriel Piemonte and the importance of Seed Banking. Seed Bank will be open – bring your extra seeds and trade them for some that you need. Plant a seed for our public learning garden in Nichols Park. Our beautifully organised seed bank is now open – thanks to the hard work Gabriel Piemonte! Let’s dedicate this potluck to Grandma! Bring your favorite dish made by your grandma, inspired by her or passed down to your mother by her. Bring the recipe card as well. If Grandma didn’t cook, bring something food-wise that reminds you of her. As always, please bring a favorite dish to share and everything you need to enjoy it – plate, utensils, glass, and a drink. (In keeping with being green, we do not provide plastic cups, utensils, or plates so please come prepared). Remember, one’s generosity and culinary care is the key ingredient for a successful and delicious potluck! So delighted have we been with the offerings thus far that an Op Shop recipe book is in the works. Grab a hay bale and enjoy. Due to technical difficulties, we were not able to show this movie last Sunday so it is rescheduled! Sorry to the folks who came out and please come back to see it this Sunday. Donations are welcomed and deeply appreciated! 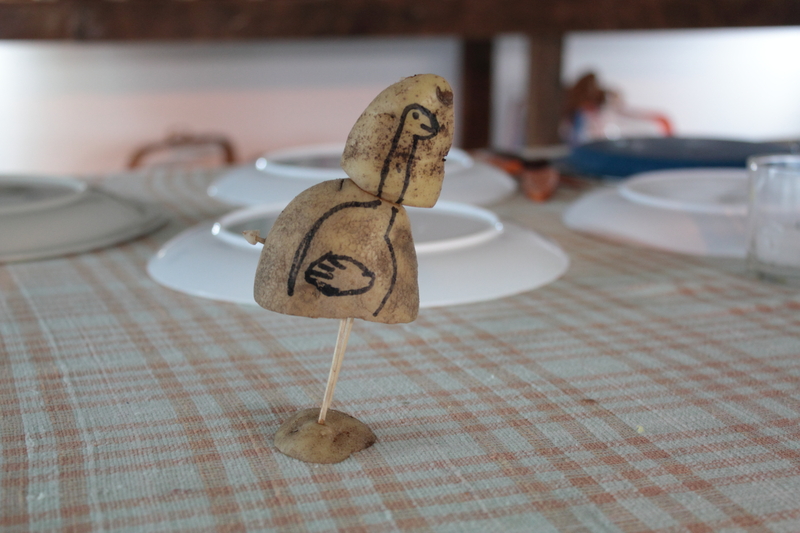 Stephanie Weaver will be with us for “Urban Chicken!” on Friday, March 11th at 3:30 pm. 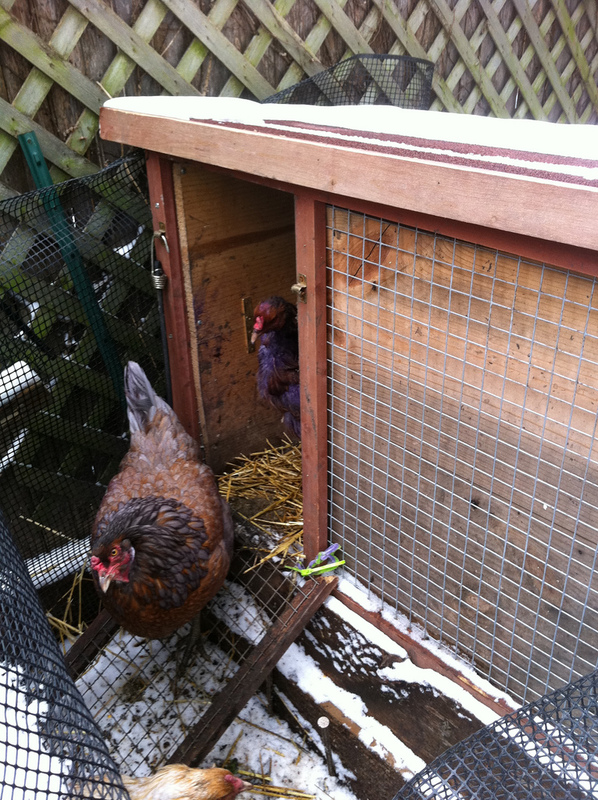 Learn about what you can do to set up a coop in your back yard! Stephanie will bring eggs from her Easter Egg Hens and talk about her experiences raising hens in the city.